The heart is a target of injury for many chemical compounds, both medically prescribed and not. Pathophysiological mechanisms underlying development of chemical-induced cardiomyopathies vary depending on the inciting agent, and can include: direct toxic effects, neurohormonal activation, altered calcium homeostasis, and oxidative stress. The fact that drug-induced heart disease, and in particular cobalt-induced cardiomyopathy, does not occur more often, as would be expected from the diversity of various mechanisms, is perhaps surprising. In spite of this, cardiotoxicity remains a major problem of hundreds of pharmaceutical agents, industrial chemicals and naturally occurring products and is often a limiting factor in treatment of certain diseases. Hence, it must be taken in account in the process of clinical decision making and treatment as well as in the process of drug research and development. The primary morphological alteration is mitochondrial damage that possibly reflects an enzymatic block of oxidative decarboxylation at pyruvate and ketogluterate levels. Due to that myofibrils of the myocardial cells were affected highlighting that the main cause of myofibril reduction could be a lower oxygen intake in the perinuclear area. The reduction of the contractile support of myocardial cells can explain the possible myocardial dysfunction. Nuclear changes were consistent with sarcoplasmic alterations, our study showing deformed, twisted, hyperchromatic nuclei with heterogeneous chromatin and even disintegrating nuclei. Changes of the interstitial connective tissue were sometimes extensive and sometimes barely noticeable. The most common alteration of this structure was the onset and development of a mainly perivascular collagen fibrillogenetic process. Zadnipryany IV, Tretiakova OS, Sataieva TP, Zukow W. Experimental ‏review ‏of ‏cobalt ‏induced cardiomyopathy. Russian Open Medical Journal 2017; 6: e0103. “Quebec beer drinkers’ cardiomyopathy” appeared as an epidemic among heavy beer drinkers in Canada in the mid-1960’s . The cardiomyopathy resembled typical dilated cardiomyopathy, except for purplish skin coloration and a high early mortality rate (42%). It was associated with development of a large pericardial effusion and low output heart failure. Quebec beer drinkers’ cardiomyopathy disappeared when Canadian brewers discontinued their new practice of adding minute quantities of cobalt to beer to stabilize the foam head. Since the Quebec outbreak, studies on experimental animals have been carried out in collaboration with Dr. С.I. Chappel to reproduce the characteristic vacuolar and dystrophic “myocardosis” of humans and to gain an insight into the pathogenesis of this condition, using cobalt administration alone or in combination with hormonal and nutritional factors [2, 3]. It is well known that cobalt (Co) is a silvery grey solid at room temperature. It is the 33rd most abundant element and has been found in a variety of media, including air, surface water, and leachate from hazardous waste sites, groundwater, soil, and sediment. Sources of exposure to cobalt and inorganic cobalt compounds are both natural and anthropogenic. Natural sources include wind-blown dust, seawater spray, volcanoes, forest fires, and continental and marine biogenic emissions. Anthropogenic sources include the burning of fossil fuels, sewage sludge, phosphate fertilizers, mining and smelting of cobalt ores, processing of cobalt alloys, and industries that use or process cobalt compounds . The largest source of exposure to cobalt for the general population is the food supply. The estimated intake from food is 5–40 µg/day, most of which is inorganic cobalt. Occupational exposure to cobalt occurs in several industries. Levels of cobalt in tobacco range from smoke [1, 2]. The ionic cobalt may be transported by blood in the body, causing adverse effects by the generation of reactive oxygen species. In vitro evidence consists of the ability of hard metal particles to generate substantial levels of oxidant species and cause lipid peroxidation, which does not occur by cobalt or tungsten carbide alone. In addition, hard metal particles have been shown to increase inducible nitric oxide synthase levels, which is responsive to oxidant stress [3, 4]. Cobalt and inorganic cobalt compounds 21 Cobalt toxicity may also be caused through oxidant-based and free radical-based processes. Exposure to soluble cobalt leads to increased indices of oxidative stress, diminished levels of reduced glutathione, increased levels of oxidized glutathione, activation of the hexose monophosphate shunt, and free radical-induced damage of deoxyribonucleic acid (DNA) [2, 5]. Knowledge of structural changes in myocardial cells and the myocardium as a whole could explain the pathophysiology of the disease and allow a correct therapeutic approach. The aim of this research was to describe the changes of myocardial cells and interstitial connective tissue during experimental cobalt induced cardiomyopathy. Fifteen 3 months-old mature male Wistar rats weighing 200-250 g were involved in the experiment. Cobalt chloride (CoCl2) water solution was administered daily orally in high dosage (60 mg/kg) which was considered to be cardiotoxic [5, 6]. After 7 days of cobalt exposure the animals were sacrificed by decapitation under ether anaesthesia according to international standards and rules of animal bioethics. Fragments of right and left ventricle after sampling was immediately placed in 4% formaldehyde solution buffered to a pH of 7.2–7.4 with monosodium phosphate and processed through the usual technique for paraffin inclusion. For the immunohistochemical study, sections were cut using the same equipment, but with a thickness of 3 μm. Sections were collected on poly-Llysine coated slides, dried in a thermostat at 370C for 24 hours in order to obtain a perfect adhesion of the biological material to the surface of the histological slide, and then stained using different antibodies (Anti-vimentin Dako V9, Anti-alpha-sarcomeric actine 5C5). After antigen retrieval, sections were cooled down to room temperature and were incubated for 30 minutes in a 1% hydrogen peroxide solution. The sections were next washed in phosphate-buffered saline (PBS), followed by a blocking step of 30 minutes in 2% skim milk. Phosphate-buffered saline (abbreviated PBS) is a buffer solution commonly used in biological research. It is a water-based salt solution containing disodium hydrogen phosphate, sodium chloride and, in some formulations, potassium chloride and potassium dihydrogen phosphate. The osmolarity and ion concentrations of the solutions match those of the human body (isotonic). Next, the slides were incubated with the primary antibodies overnight at 400C, and the next day, the signal was amplified for 30 minutes using a peroxidase polymerbased secondary detection system (EnVision, Dako). For electron microscopy fixation of myocardium was performed by immersion in the mixture of 1% paraformaldehyde and 1.5% glutaraldehyde in 0.1 M phosphate buffer at PH 7.4. After fixation, the specimens were postfixed in a 1% osmium tetroxide solution, and then washed 3 times in the buffer solution, continuing with dehydration from 50% ethanol, then with uranyl acetate (2% in 60% ethanol) with ascending graded ethanols up to 100%, and then washed in propylene oxide. They were embedded in an Epon-Araldite composite, after that semithin sections and ultrathin sections were cut on an ultra-microtome UMTP-7. Semithin sections were stained with tolouidine blue and ultrathin sections, with lead citrate, and examined with a SELMI electron microscope. 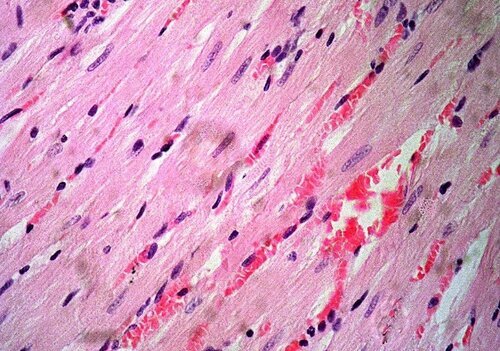 Systematic analysis of myocardial tissue from the left ventricle by conventional histological staining, allowed us to observe that cobalt cardiomyopathy is characterized by significant changes within both myocardiocytes as well as the interstitial connective tissue. 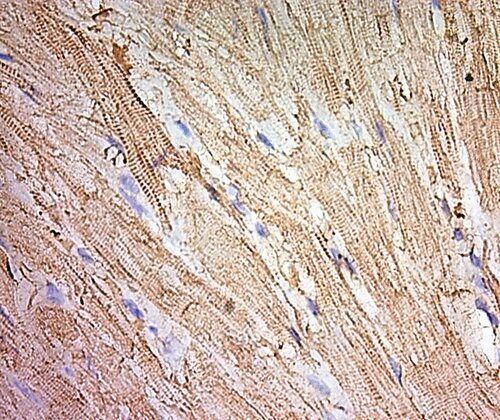 Myocardial cells showed variable staining patterns because of changes in intracytoplasmic structures. An attenuation of the myofibrils was the most common observation. In some myocardial cells the reduction of myofibrils appeared relatively homogenous, translated into a reduction of staining intensity and attenuation of myofibrils, while in other cells the reduction of myofibrils was heterogeneous which resulted in a vacuolar sarcoplasmic pattern, particularly on cross-sections of myocardial cells (Figure 1). 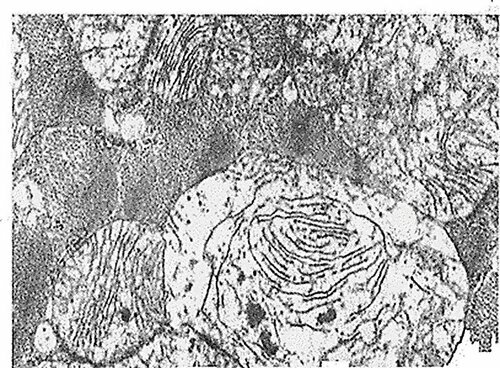 Most often myofibrils in the central area of the myocardial cells were affected and to a lesser extent those in the periphery, highlighting that the main cause of myofibril reduction could be a lower oxygen intake in the perinuclear area (Figure 2). The reduction of the contractile support of myocardial cells can explain the possible myocardial dysfunction that can lead to chronic heart failure . Nuclear changes were also quite common. Most often there were found deformed, twisted, hyperchromatic nuclei, with chromatin arranged in an uneven pattern; sometimes pyknotic nuclei with chromatin organized in homogeneous disintegrating blocks were seen. Nuclear changes were consistent with sarcoplasmic changes in the sense that if sarcoplasmic changes were significant, so were nuclear ones. We believe that nuclear changes reveal an irreversible important cell suffering. Figure 1. Myocardiocytes sladge hemorrages (a) marked and uneven reduction of myofibrils and uneven appearance of the sarcoplasm (b) (HE stain, ×400). 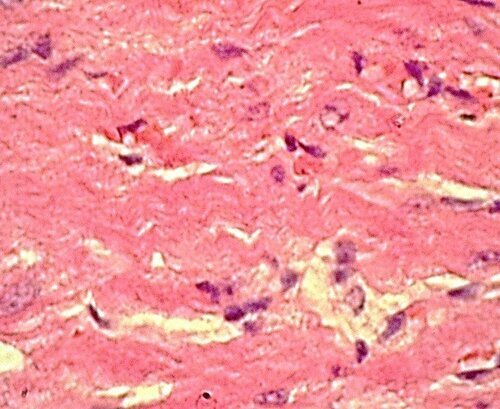 Myocardial connective tissue changes were sometimes significant and sometimes barely noticeable. The most frequent and constant change in this structure was the emergence and development of collagen fibrillogenesis process. In the early stages, this process was reported to be more intense in the perivascular areas, which could be explained by the increasing synthesis activity of fibroblasts present in this space. At some level, the collagen fibrillogenesis expanded progressively, dissociating heart muscle fibers, isolating them from the neighboring ones (Figure 3). It is possible that interstitial fibrillogenesis processes begin because of a chronic myocardial ischemia, which would explain myocardiocyte suffering manifested by a reduction of intermediate filaments, cytoplasmic organelles and myofibrils . 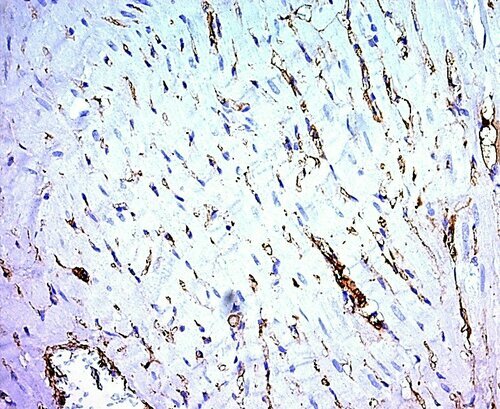 For the evaluation of myocardial interstitial connective tissue reaction in dilated cardiomyopathy, we investigated the vimentin immunohistochemical reaction knowing that vimentin is a major intermediate filament protein present in mesenchymal-derived cells. In our study, we found that the reaction to vimentin was intense in the interstitial tissue of the ventricular myocardium, where proliferative and fibrillogenetic processes were more intense (Figure 4). We believe that vimentin specifically marked the fibroblast-type connective cells, responsible for collagen fibrillogenesis. In other words, the reaction to vimentin can be used for early diagnosis of myocardosclerosis . The most ubiquitous fine structural feature of the myocardial lesions was swelling of the mitochondria, with decreased matrical density and, finally, disruption of the cristae and the outer membrane (Figure 5). In addition, dilatation of sarcoplasmic reticulum and intrasarcoplasmic oedema were noted. The myofilaments were pushed to the periphery of the cell or occupied a perinuclear position. These histological and fine structural alterations correlate well with the metabolic derangement of protein deficiency and cobalt. Cobalt interferes with myocardial energy metabolism, as it irreversibly chelates with the dithiol form of lipoic acid, inactivating the coenzyme required for the oxidative decarboxylation of pyruvate to acetyl coenzyme A and alpha ketoglutarate to succinate. Pyruvate and lactate accumulation in the mitochondria increases osmotic pressure and results in water binding, oedema, and finally structural disruption. Consistent with other observations [3, 10], we also found that myocardiocytes experience an extensive loss of myofibrils, giving an empty or vacuolated appearance to the sarcoplasm. The changes of the myocardial interstitium identified by us are common and are mentioned by other researchers. The dominant lesion found in our cases was myocardial fibrosis. The collagen fibrillogenesis process may be due on one hand to myocardial hypoxia and on the other hand to the presence of large numbers of fibroblasts. It is known that, under hypoxic conditions, fibrocytic-type connective tissue cells have the ability to transform into fibroblasts, young connective cells that synthesize and excrete large amounts of connective matrix. The presence of an increased fibrotic process involves a possible role of transforming growth factor beta 1 (TGF-β1) in the pathology of dilated cardiomyopathy. In our study, we sometimes found large amounts of fibrillar collagen, arranged in coarse bundles within the myocardial interstitium [10, 11]. 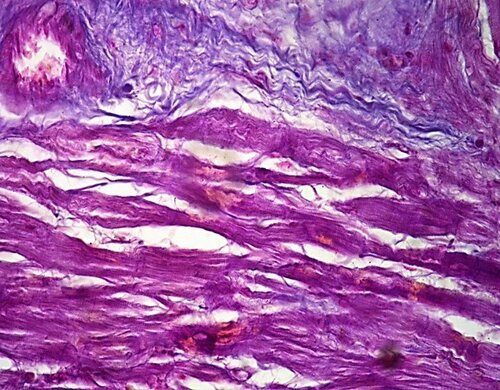 We believe that this accumulation of fibrillar collagen in the interstitial space of myocardium reduces cardiac performance in both the systole and diastole. In addition, by modifying local vasculature, interstitial fibrosis reduces the O2 supply and hastens the death of myocardiocytes. The pathophysiology of cobalt cardiomyopathy is heterogeneous both in terms of its pathogenesis and pathology. Histological changes associated with dilated cardiomyopathy non-specific and not all may be present simultaneously. The fact that drug-induced heart disease, and in particular cobalt-induced cardiomyopathy, does not occur more often, as would be expected from the diversity of various mechanisms, is perhaps surprising. In spite of this, cardiotoxicity remains a major problem of hundreds of pharmaceutical agents, industrial chemicals and naturally occurring products and is often a limiting factor in treatment of certain diseases. Hence, it must be taken in account in the process of clinical decision making and treatment as well as in the process of drug research and development. The primary morphological alteration is mitochondrial damage that possibly reflects an enzymatic block of oxidative decarboxylation at pyruvate and ketogluterate levels. Due to that myofibrils of the myocardial cells were affected highlighting that the main cause of myofibril reduction could be a lower oxygen intake in the perinuclear area. The reduction of the contractile support of myocardial cells can explain the possible myocardial dysfunction. Nuclear changes were consistent with sarcoplasmic alterations, our study showing deformed, twisted, hyperchromatic nuclei with heterogeneous chromatin and even disintegrating nuclei. Changes of the interstitial connective tissue were sometimes extensive and sometimes barely noticeable. The most common alteration of this structure was the onset and development of a mainly perivascular collagen fibrillogenetic process. Вarceloux DG. Cobalt. J Toxicol Clin Toxicol 1999; 37: 201-206. De Boeck M, Kirsch-Volders M, Lison D. Cobalt and antimony: genotoxicity and carcinogenicity. Mutat Res 2003; 533: 135-152. https://dx.doi.org/10.1016/j.mrfmmm.2003.07.012. Wiberg GS, Munro IC, Morrison AB. Effect of cobalt ions on myocardial metabolism. Can J Biochem 1997; 45: 1219-1223. https://dx.doi.org/10.1139/o67-142. Elliott P, Andersson B, Arbustini E, Bilinska Z, Cecchi F, Charron P, et al. Classification of the cardiomyopathies: a position statement from the European Society of Cardiology Working Group on Myocardial and Pericardial Diseases. Eur Heart J 2008, 29(2): 270-276. https://dx.doi.org/10.1093/eurheartj/ehm342. Wenner CE, Yan S. Biphasic role of TGF-beta1 in signal transduction and crosstalk. J Cell Physiol 2003, 196(1): 42-50. https://dx.doi.org/10.1002/jcp.10243. Soufen HN, Salemi VM, Aneas IM, Ramires FJ, Benício AM, Benvenuti LA, et al. Collagen content, but not the ratios of collagen type III/I mRNAs, differs among hypertensive, alcoholic, and idiopathic dilated cardiomyopathy. Braz J Med Biol Res 2008, 41(12): 1098-1104. https://dx.doi.org/10.1590/S0100-879X2008001200009. Brower GL, Gardner JD, Forman MF, Murray DB, Voloshenyuk T, Levick SP, Janicki JS. The relationship between myocardial extracellular matrix remodeling and ventricular function. Eur J Cardiothorac Surg 2006; 30(4): 604-610. https://dx.doi.org/10.1016/j.ejcts.2006.07.006. Ahmad F, Seidman JG, Seidman CE. The genetic basis for cardiac remodeling. Annu Rev Genomics Hum Genet 2015; 6: 185-216. https://dx.doi.org/10.1146/annurev.genom.6.080604.162132. Igor ‏V. Zadnipryany – MD, Department of Topographical Anatomy, Medical ‏Academy n.a. S.I. Georgievsky, V.I. Vernadsky Crimean Federal University, Simferopol, Russia. http://orcid.org/0000-0002-8181-9709. Olga ‏S. Tretiakova – MD, Department of Social Medicine and Public Health Economics, Medical ‏Academy n.a. S.I. Georgievsky, V.I. Vernadsky Crimean Federal University, Simferopol, Russia. http://orcid.org/0000-0002-2476-0624. Tatiana P. Sataieva – MD, Department of Medical Biology, Medical ‏Academy n.a. S.I. Georgievsky, V.I. Vernadsky Crimean Federal University, Simferopol, Russia. http://orcid.org/0000-0001-6451-7285. Walery ‏Zukow – MD, Faculty of Physical Education, Health and Tourism, Kazimierz ‏Wielki ‏University, Bydgoszcz, Poland. http://orcid.org/0000-0002-7675-6117. © 2017, Zadnipryany I.V., Tretiakova O.S., Sataieva T.P., Zukow W.